Enjoy a tasty summer cocktail and gather your own ingredients from Berryburst MAX’s paytable with 5 reels, 3 rows and 10 paying lines. NetEnt’s refreshing title features attractive visual appearance combined with nice rewards produced by Wilds, Expanding Wilds and Re-Spins, but also comes with a 10000-coin jackpot. Interested to get some tips and learn how to win? Read the Berryburst MAX slot review. A screenshot is worth a thousand words, right? Here you go! But in the end, you have to try Berryburst MAX yourself – one of the recommended casino sites should fit perfectly! The game comes with the Cluster Pays mechanics, meaning you will receive a payout when form a cluster of 5 or more icons of the same kind. Wilds have a bit higher rating than other symbols and may substitute any other item. Moreover, the winners will claim the Berryburst MAX bonus prize of 10.000 coins when 15 Wilds create a cluster. During the base game, 1+ Wilds will turn into Expanding Wilds and guarantee at least 1 Re-Spin. The coin value ranges from €0.01 to €2, so you can deploy any strategy worked out in the Berryburst MAX free play mode around NetEnt-powered sites. Note that you can set the betting level as well, which goes from 1 to 10 with 10 coins per level and allows wagers between €0.10 and €200 per round. Instead of the classic Berryburst MAX free spins, you can actually receive tons of extra rounds during Re-Spins as each new Wild or two guarantees 1 more free spin. Also, Wilds will expand and cover the entire reel for as long as you keep forming the winning combinations. Should you manage to get all 5 Wilds expanded, there would be no extra spin, but you’ll land a big win. 3. What is the RTP factor of Berryburst MAX? The RTP stands at 96.23%, according to the official info. 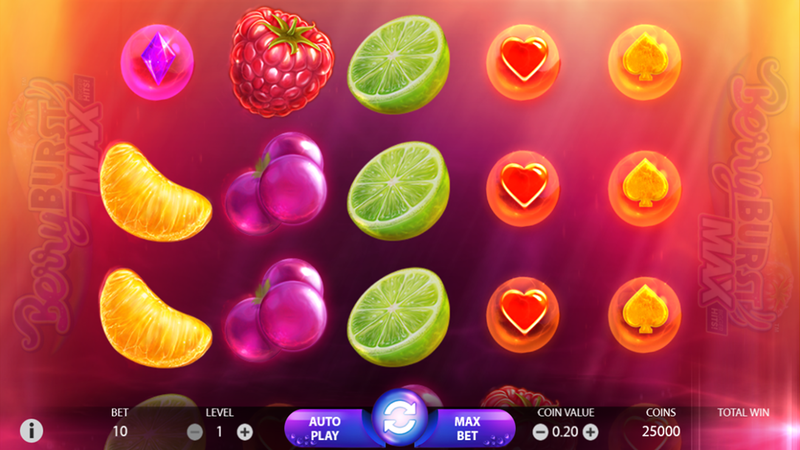 This is another fruity slot, but with eye-catching graphics and tons of lucrative options. We’re sure that tricks you gathered in the Berryburst MAX recension will be helpful, so don’t mind the house edge and try this game as its jackpot prize could actually boost your balance to a larger extent.